If you have an aquarium at home, it is important that you know how to monitor it's temperature properly. Having an aquarium thermometer is the place to start! An aquarium thermometer measures the water temperature inside an aquarium so that it is at the best level for the fish and any other aquatic animals you may have inside. Fish and other animals that live in the water are very sensitive to temperatures and sudden temperature changes. Certain fish need their water to be in a certain range not only to be comfortable, but to live. With an aquarium thermometer you can maintain the temperature of the aquarium and thus, make the surroundings of the fish more comfortable. When you are buying a thermometer for your aquarium, make sure that it is a well rated and popular one that is built to last! The temperature in your aquarium will vary from day to day and especially from one season to another. 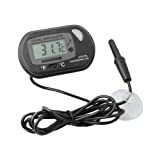 There is a huge range of aquarium thermometers that you can find in stores or online. Some aquarium thermometers are digital and have become more popular of late. They tend to be easier to fit or attach to the aquarium and are much simpler to get a reading from. 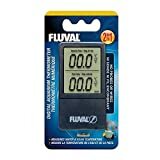 If you are not sure on what type of aquarium thermometer to get, here are examples that might help point you in the right direction. 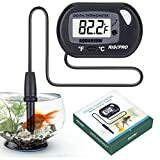 One of the most popular choices on Amazon is this waterproof aquarium thermometer. It is positioned inside the tank and has an easy-to-read digital display. It's easy to put in position as it sticks to the side of the aquarium with a really strong 'sucker' pad. Many fish owners like the accuracy of digital thermometers. They can often look very good too! Alternatively, a more traditional manual reading options is this precise fish tank thermometer. Again, it sticks to the inside of the tank and you can read the temperature from the gauge in both Celsius and Fahrenheit. 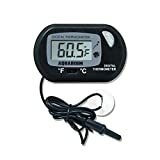 It's a great cheap option and many aquarium owners prefer the safer option of this non-digital thermometer. Perhaps the more basic option is this stick-on vertical fish tank thermometer strip. The back of it is sticky so it's a doddle to attach to the front of your aquarium. It shows temperature readings in both Celsius and Fahrenheit. This is probably the cheapest type of aquarium thermometer. There's plenty of other types of fish tank thermometers available as you can see from this huge range on Amazon. Whichever aquarium thermometer you buy, always consider the health and safety of your fish. By being able to monitor the temperature inside the aquarium, your fish can live long and healthy lives.